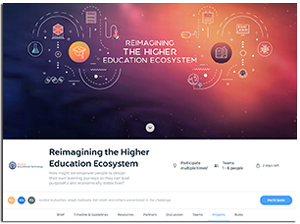 With just a few days to go in the competition, nearly 80 detailed projects have been submitted to the U.S. Department of Education Office of Educational Technology's "Reimagining the Higher Education Ecosystem Challenge." (Many more have been posted by name but lack fleshed-out descriptions.) The idea of the challenge is to spark "bold ideas" about how post-secondary education could be "reimagined" to expand access to more people and to draw on the ecosystem of alternative instructional providers that surrounds colleges and universities (such as online classes, bootcamps, on-the-job training and other forms of informal learning). Projects also need to fit into one or more of three "opportunity areas": curating lifelong learning pathways, creating a marketplace for student learning and leveraging emerging technology. Development of a system for long-term income share agreements that would allow schools to invest in student success in exchange for a share of the student's future earnings. Participants have until Aug. 8, 2018 to submit a basic application that sketches out the idea. From there, 25 projects will be picked through two rounds of judging and a "people's choice" vote. In the final go-around, up to 10 winners will be selected. The Michelson Runway's 2019 demo showcase. In addition, the top two audience-choice winners will receive registration to attend the ASU+GSV Summit next year. "We need more creativity when it comes to seeding the learning ecosystem of the future," said Michelle Weise, chief innovation officer for the Strada Institute for the Future of Work, in a prepared statement. "We all talk a lot about lifelong learning, but we need to start building the foundation of that future ecosystem. We'll have to design a competency marketplace, shared taxonomies between educators and employers, portable, lifelong learning accounts, and robust coaching/navigating services to help us move more seamlessly in and out of learning and work. This challenge is a great first step toward collaborating on that shared future." Learn more at the challenge website.